You will have a quick access to all marinade flavours and product codes. The printable document also includes coloured symbols that allow you to identify at a glance which marinades are spicy. We have also marked our best selling products in Quebec with a gold star! The printable document also includes suggestions to help you create your own marinades. Perfect marinade for the grill. Perfect for beef, especially flank steak or hanger steak. 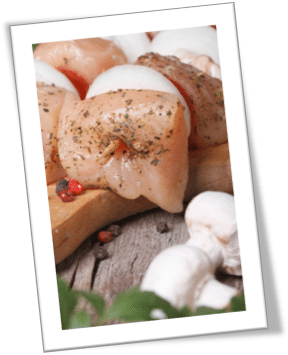 European marinade with a taste of Dijon mustard, with a cream colour and a creamy texture. Traditional Greek taste. Delicious with pork or chicken. Traditional honey & garlic marinade. Sweet marinade of a light red colour made with Italian spices (garlic, oregano, and basil). Fresh taste of lemon. Excellent on white meat. Yellow marinade with black peppercorns – excellent on white meat. New recipe with less salt. Traditional Quebec taste – excellent with pork! Asian style marinade with a taste of orange, soy sauce and sesame seeds. Strong taste of mint for Middle East dishes. Delicious with lamb! Indian marinade with a nice yellow colour. Asian style marinade with a taste of soy sauce, ginger, and garlic. Lebanese flavour, to be prepared with plain yogurt and white vinegar. A hint of acidity with lots of vegetable, onions, garlic, peppers, and chives. Indian-inspired marinade with a classic taste of tandoori. Soy sauce marinade of a dark colour. Perfect for any style of meat… even tofu! Marinade with a basil and tomato taste, with pieces of dried tomatoes. Delicious with veal! These other marinades have a slightly different method of preparation than Mariné Plus Sauces. Marinade with a taste of General Tao Chicken. Delicious with white meat.